The custom of Piping the Side dates from the days of sail when ship’s Captains were frequently called upon to report onboard their senior officer’s Flagship at sea to receive or discuss orders. On those occasions when the sea state was too rough to permit the use of sea gangways, it was customary for a visiting captain to enter and leave his boat by means of a Bosun’s chair rigged on a yardarm whip. The boat carrying a visiting captain would lay off the flagship and an order would be given to ‘Hoist him in’. The captain concerned would then be hoisted out of his boat and inboard with the requisite orders being passed by pipes made on a Bosun’s call. The present call used for ‘Piping the side’ has its origins with the pipe once used for ‘hoisting and walking away’. 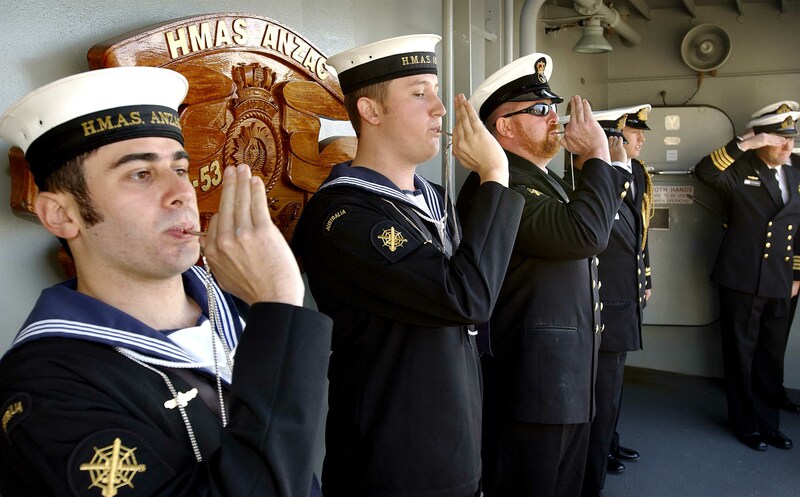 Over time this practice evolved and the use of this ‘pipe’ transcended into a form of salute which is routinely practised, in varying ways, throughout many of the world’s navies. 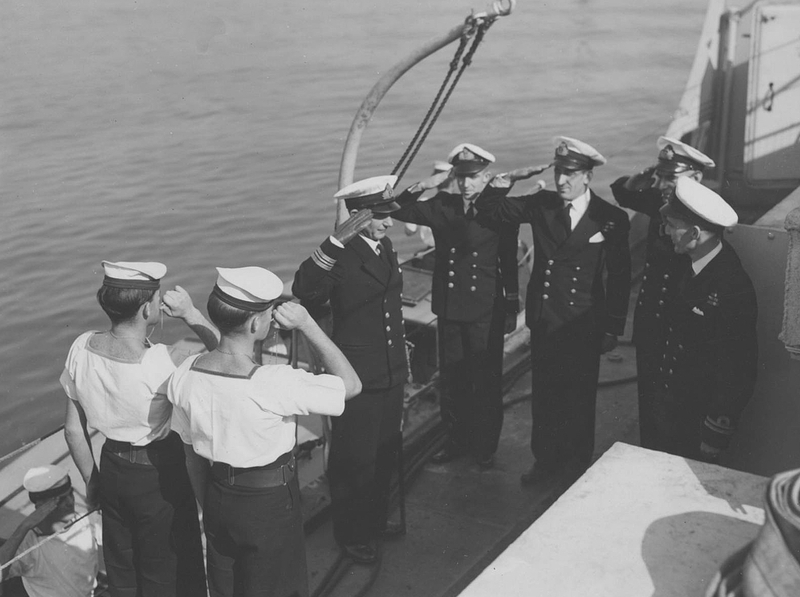 Ratings on board HMAS Culgoa pipe their commanding officer, Lieutenant Commander HL Gunn, DSC, RAN on board following his arrival by boat, 29 May 1947. 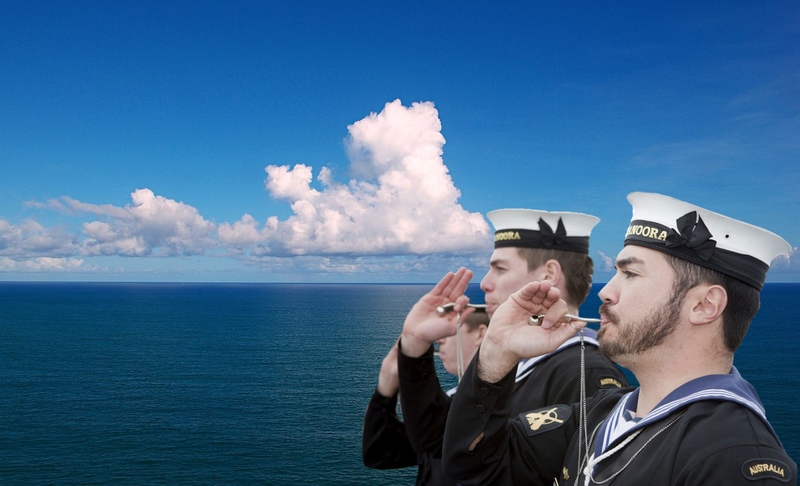 Today ‘Piping the side’ is purely a form of salute forming part of what is known as gangway ceremonial. By custom, and due largely to its purely nautical origins, Piping the Side is not extended to officers of the other Services or Consular Officers. It is, however, customary for the corpse of any naval officer or sailor transferred ashore for burial to be piped over the side when they leave the ship for the final time. Gangway staff piping the side on board HMAS Anzac (III). Gangway ceremonial, including the presentation of Battle Honour Boards, continues to play an important role in naval customs and traditions. Left: In days gone by, piping served many practical purposes in a ship's routine as can be seen in this chart. Right: A junior sailor makes a pipe of the ship's main broadcast. 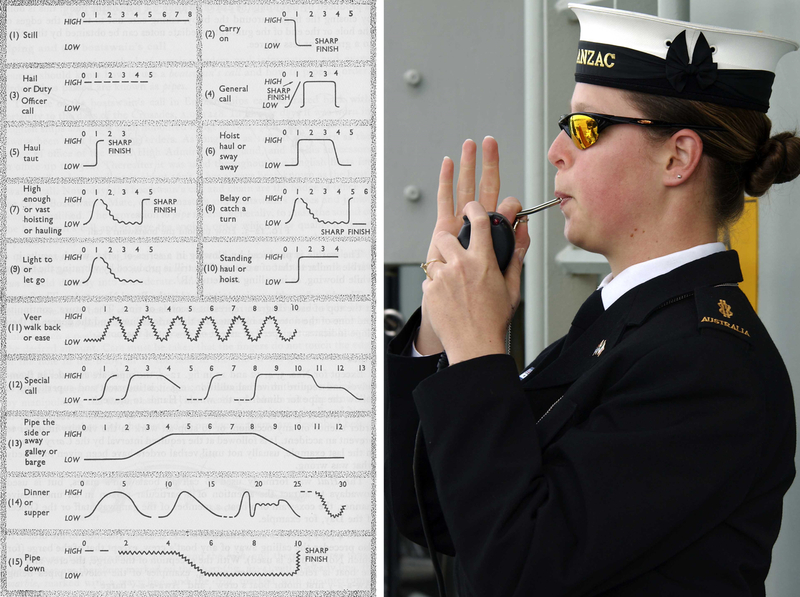 The ubiquitous bosun's call in use in navies since the days of sail.